Utilise our links with big media brands to get on the inside of this exciting industry. "Following a recommendation by my tutor, I did a work experience placement at ShortList magazine. I loved my time there and learnt so much. I learnt about the fundamentals of how the magazine functions, helped with cover stories and transcriptions, and even wrote some articles which got published. The team at ShortList were extremely complimentary of my writing style and that's all down to the way I was taught on the course. The course itself is fantastic - even from the first year it allows you to meet new people and start making useful contacts, and year on year my list of contacts has grown." Contacts and experiences to help you shine. Former student, Aimee Jakes, now works for Heat, Closer, Grazia and Empire magazines online. Ffion did a work experience placement with publishing heavyweight, Immediate Media. Lecturer Jude Rogers' CV includes stints NME and The Wire, and she's judged the Mercury Music Prize. Stunning spaces to bring your ideas to life. The School of Media is based at our Park Campus, which was originally designed as a botanical garden. As such, landscaped gardens and lakes provide a stunning backdrop for our modern teaching centre. Our new and purpose-built Media Centre provides industry-standard, specialist facilities - including a fully-equipped Mac suite and a dedicated teaching room for Magazine Journalism. Our studios and production spaces form an interdisciplinary hub where students can collaborate and create exciting work together. "I started out as a journalist on local newspapers and then worked as a feature writer for the tabloid press. It was during this time that I decided I wanted to work in magazines. I worked my way up the ladder and eventually became Editor of a celebrity magazine, during an extremely exciting time in showbiz journalism. During my editorship, the shift in celebrity culture and how we consume this kind of news was dramatic. 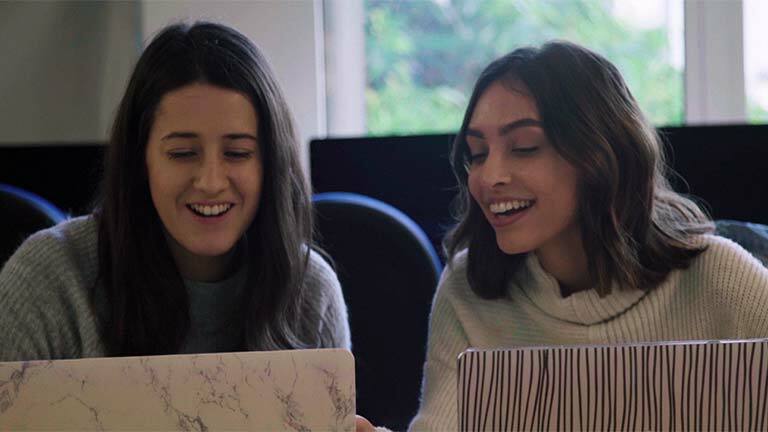 The rise of social media, digital content and reality TV has led the industry to adapt and evolve, and we explore these ongoing developments with our students. All of the lecturers on this course are still practising journalists, working for a whole range of titles from Grazia and OK! to the Observer and the Sun. Work experience is absolutely vital in this field, as it's the only way to show potential employers what you can do, and how committed you are to achieving success in a competitive environment. Our extensive contacts in the industry mean we are able to help students set up placements and get that relevant experience." Hear Holly talk about getting hands-on experience while creating and producing an independent magazine during her course. From lifestyle, fashion, music and sports magazines to newspaper supplements, you will develop key magazine production skills, including design, marketing, and business strategy. You will also learn important journalism skills, such as feature writing and video production. The course focuses on both digital and print production, including online magazines and publications for tablets. This is a new degree, designed, developed and taught by practising magazine and media professionals. You will develop practical skills and an in-depth understanding of the most recent industry trends in preparation for a rewarding graduate career. The journalism department has strong ties with magazine publishers such as Immediate Media, the home of more than 60 brands including Radio Times, Top Gear, BBC Music Magazine and Good Food. The team also has links with high-profile industry professionals. Former editors of Heat magazine and NME are among guest lecturers who have visited the university. This close contact with industry ensures you will benefit from expert insight into the world of magazine publishing, as well as valuable work placement opportunities. Cheltenham is home to more than 45 festivals including the internationally renowned Cheltenham Literature Festival. Our students take part in many different media projects to develop their skills and build networks with industry professionals. We also run our own annual media festival which attracts high-profile guests and successful alumni. Get Magazine Journalism and Production course updates and hear more about studying with us. Students on this course will learn a range of key practical magazine journalism and production skills, including feature writing and multimedia production. You will use Mac computers and the latest industry software in our state-of-the-art newsrooms and studios. In your final year you have the option of doing an academic dissertation or an extended practical project. You will also benefit from completing a work placement as part of the degree, giving you essential industry experience. The journalism department has strong ties with magazine publishers such as Immediate Media, the home of more than 60 brands including Radio Times, Top Gear, BBC Music Magazine and Good Food. The team also has links with high-profile industry professionals. The former editors of Heat Magazine and NME have been guest lecturers. These close connections with industry mean you will benefit from expert industry insight and valuable work placement opportunities. Fill in the form below and we'll be in touch with Magazine Journalism and Production updates, upcoming events and everything you need to know about university life.